My paternal grandmother, Lena Sarah Marlow, was born on October 9, 1889 in Lynnville, Morgan, Illinois. She was the eldest daughter of Joseph H. Marlow and Anna Belle Bosomworth. (Her siblings are described in my posting on Joseph and Anna Belle). 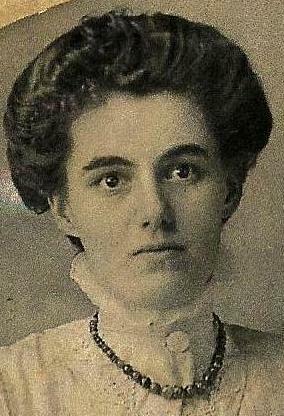 She married George Arthur Smith, likely in Illinois, between 1910 and 1912. George Arthur Smith, born April 18, 1892 in Medora, Illinois, was the son of Martha Loretta Smith, (Smith was her maiden name). He possibly had a twin sister, Heneritta, (not "Henrietta" it seems), who died in 1899. Besides Heneritta, he had six other siblings, Della, Harris Russell, James Leslie, Estella, Joseph Milford, and Harry Andrew. These were all the children of his mother and her husband, William Asbury Cox, whom she married in about 1898.The first record I have of George Arthur is in the 1900 U.S. census, where he is living with his mother and stepfather, and his last name is Cox. He is the only child living with them at this point, as all of his younger siblings are born later. (There may have been a daughter born to the Coxes in 1899 who died the same year). His mother had married Wallace W. Gafney on March 1, 1893, and he is therefore a much more likely candidate to be George Arthur's biological father than William Cox. That George Arthur did not take the name Gafney seems to indicate that Wallace may not have been his father, or that he did not care for him, as Wallace and his mother did not remain married, as the the records show that he married another woman in 1903. His mother Loretta's family seem to have been among the first settlers in Macoupin County, Illinois, and prior to that to have come from North Carolina. So far, in a very preliminary way, as I have just started to look more closely at this line today, the Smith family seems to go back in America to the mid 1700's, and some lines to the mid 1600's. Other lines lead to Virginia and Kentucky, with some ancestors having fought in the American Revolution. I expecting to find that George Arthur's ancestors go back to the earliest days of America on his mother's side. I will add updates as I keep investigating the Smiths, mainly for the sake of my Smith cousins. (Based on this brief look at the data, it is starting to appear that it if George's descendants are interested in exploring his paternity, that they might find it helpful to do a family history oriented DNA test, utilizing the Y chromosome, on one of the male Smiths to see what surnames pop up). Although Lena's own family was newly American from England, the two men she married and had children with, George Arthur Smith and George Hart, both seem to have had deep roots in Colonial America. Before Lena and her new husband starting having children, they followed her parents to Lougheed, Alberta in 1913, with the apparent intention of living there and taking up farming, but returned to Illinois. This may have been partly because his mother's husband may have abandoned the family to live with his mother around this time. (This is speculation based on the data and on a report from another Ancestry member). It appears that Lena and Arthur (as he was called) returned to living in Medora, Illinois, where they had their first four children Glenn Marlow, Joseph Vernon, Wilbur, and Roberta. Arthur worked on H.C. Warner's farm near Medora, and later worked for the railroad. They returned to Lougheed to stay in September 1919, where they had four more children, Dorothy, Byron William, Elwood, and Ralph. 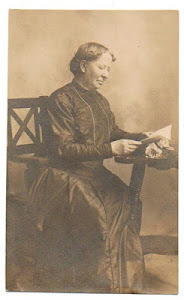 There is a good account of the Smith family story in Verdant Valleys In and Around Lougheed, written by my Aunt Roberta, at the following link: http://www.ourroots.ca/e/page.aspx?id=3517428. There is also an early picture of the family there. Unfortunately, Arthur drowned in Phouts Lake while fishing on May 14, 1928. That fall, the family's house burned down. Lena then bought her father's farm (he had passed away), and the older boys did the farming, but they were "dried out" in 1929.